Garfield was actually created by Jim Davies back in 1978, so he’s not doing too badly for a 40-year old cat. I imagine his love of lasagna, hatred of Mondays, general lazy nature and obsession with eating have not necessarily aided his longevity. 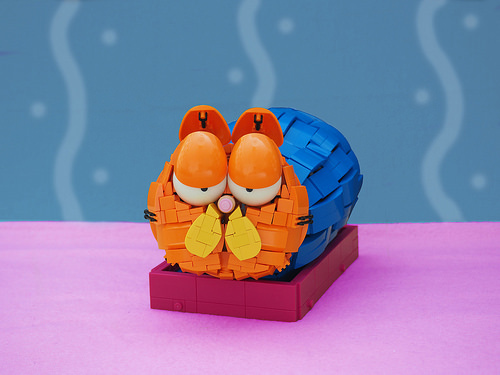 This instantly recognisable LEGO version was built by Vlad Efremkin and captures Garfield’s reluctance to get up out of his cat bed in the morning. Those heavy eyelids are a particularly effective use of Commander Cody or Poe Dameron’s shoulder armour.